Hello Moto users, now Official Android 7.0 Nougat update is available for the Moto X Style [Pure Edition] phone. The new Nougat update comes with new May Android security patch. Besides, the update also installs the Google Duo video calling app on the smartphone. Moto X Style Android 7.0 Nougat OTA update is already rolled out and many users already updated their phone’s with this new official nougat update. To apply this update on your Moto X Style [Pure Edition] all you have to download one zip file and install the update from stock recovery. To check the update on your phone go to Settings > About Phone > Software updates. The update should take about 10 to 15 minutes to get installed on your phone. Or you can use this guide to install the update manually on your phone. The nougat update comes with lots of new features which include enhanced Doze mode, revamped notification shade and Quick Settings menu, and of course, the multi-window split-screen mode among other features. So let’s get started and download the Android 7.0 Nougat update and install on Moto X Style [Pure Edition]. 1. This guide is only for the Moto X Style XT-1572 users and don’t apply this method on any other Moto device. 2. Make sure to take the full backup of your phone for safer side and then proceed. 4. Also, try to maintain at least 60% of battery life on your phone before installing the update. Here are we are using the two different methods to update the Moto X Style with this official Nougat update. First one is the Stock Recovery method and second is the ADB commands. Choose any one which one you like and follow all the steps very carefully to Succesful install the Android Nougat update on your phone. 1. 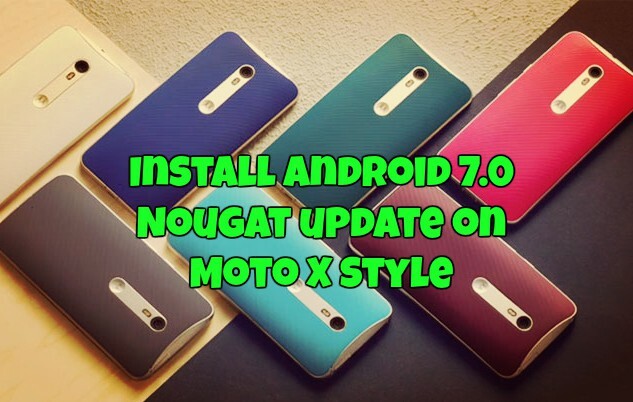 Download the Android 7.0 Nougat update for Moto X Style from the above mention link and save the file on your phone’s internal memory. 2. Now time to boot your phone into Stock Recovery mode. To do this completely switch off your phone. Now Hold Power + Volume Down button. Now you can see “No command“ on your phone screen, hold Power + Volume Up and select the Recovery option. 3. Once your Moto X Play in stock recovery, select option apply update from sd card. 4. Now locate the Nougat update zip that you saved on your phone to install the File. 5. Now the installing process will start on your Moto X Play, and this will take some time. Wait until the process finishes. 6. Once the update is installed on your phone, Reboot your system and enjoy. 1. Enable USB debugging on your phone. Go to Setting > Developer option>. To enable Developer Options, go to About phone and tap the Build Number 7 times. 2. Setup the ADB and fastboot drivers for your Windows from here. After that, you can see the ADB folder on your Windows C Drive (C:/ADB). 3. Now open the ADB folder that you created above and paste the Nougat update ZIP File (NPH25.200-15 OTA zip) in the folder. 5. From the recovery menu of your phone, Choose Apply update from ADB. 7. 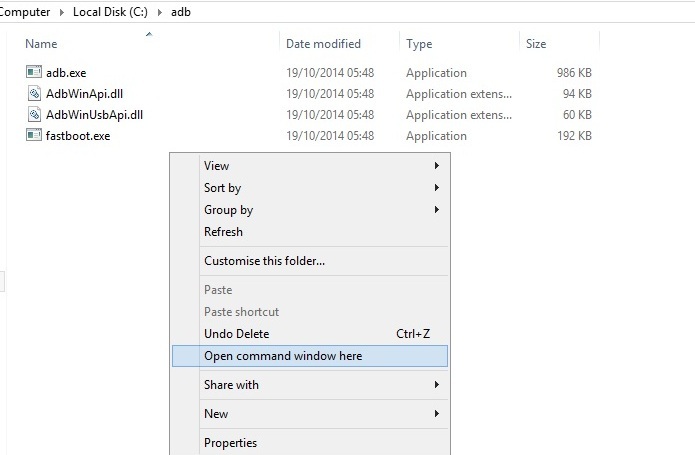 Open the ADB folder in which you saved the OTA zip file and press shift+right click and click on open command here. 8. Now type the following command to check the connection with your device. 9. Now type this command to flash the Nougat update on your phone. The file name is the name of the zip file. 10. Now, wait until the process completes and once completed then Reboot the phone. So with these two methods, you can update your Moto X play with the new Nougat update. These are the best and quickest method to install the latest update on your Moto phone. If you are facing some problem during flashing process on your phone, leave the comments below.